I arrived at the stadium at 4pm, walked up to the ticket window, and asked what the cheapest available seat was. Way up in the upper deck. I stepped out of line and thought about it…took a little stroll…counted my money…made a phone call…hated my life at that moment…and walked back to the adjacent window where I was told that the cheapest seat was seventy bucks. Just as I was about to hand over the money, a man and woman walked up next to me and said they had a few extra tickets they were trying to get rid of and would sell one for $25. These people looked presentable. They were friendly and articulate. They’d just flown in from Utah (or so they said). They gave me a whole story about how they’d bought four print-at-home “tickets” and then upgraded to better seats at the last second and were now trying to sell the cheap ones to get their money back. Was this a scam? I had no idea, but I decided it’d be better to get ripped off for $25 by people unaffiliated with the Yankees than to knowingly GIVE the Yankees $48. Therefore, I bought one of these so-called “tickets” and got in line at Gate 6. The only thing that made it a “ticket” was the bar code which was going to get scanned at the gate. How did I know that these people hadn’t xeroxed this “ticket” 20 times and sold them to other suckers like me? I didn’t. But it turned out that the “ticket” was legit. At the very instant that I got it scanned, one of the security guards started shouting. At first I hoped that she wasn’t shouting at me, and when it became apparent that she was, I pretended not to hear her. Long story short: Drawstring backpacks are no longer allowed inside Yankee Stadium. After security pulled me away from the turnstile (followed immediately by another “are-you-serious” moment), I was faced with a choice. I could either check my back across the street in the bowling alley…or throw it out. I was so ********** at that point that I nearly went home. I was contemplating making THIS the final time that I ever set foot NEAR Yankee Stadium, let alone inside of it, but I surrendered to security. I just really wanted to be at a baseball game. I told the guards (yes, plural) who surrounded me that I would throw out my bag, and they escorted me to the nearby dumpster. (Keep in mind that while this was happening, hundreds of fans were filing past me and heading into the stadium for batting practice.) I started taking out all my stuff, and I really had no idea how I was going to manage. In addition to my glove and hats, I had my camera, cell phone, keys, wallet, rosters, water bottle, rubber bands and Sharpies (for the glove trick), ball-point pens, and a book (“Three Nights in August” which is pretty good). It was crazy. And then, by some miracle, all the guards dispersed and turned their evil attention elsewhere. I quickly rolled up the bag and stuffed it into my pocket and entered the stadium. No one said a word. Once I reached the right field seats (which were already crowded), I took out my bag and put all my stuff back in it and began the painful process of trying to snag. Again, no one said a word…that is, about the bag…but when I tried to use the glove trick soon after, the on-field security guard ran over and yelled at me and said I wasn’t allowed. WHAAAAAT?!?! Was I in some alternate universe where the snagging gods hated me? Well, yes, and it’s called Yankee Stadium, but beyond that basic fact, I learned that there were new rules in effect in preparation for the All-Star festivities. Un-effing-believable. The Rangers started hitting at around 5:35pm. Half an hour later, when I still hadn’t snagged a single ball, I was officially in Panic Mode. Thankfully, the corner spot (in the front aisle, all the way out as close to the bleachers as you can go) remained open, and I slipped into in. Once I was there, however, there was no room to move anywhere else, and to make matters worse, I couldn’t identify any of the Rangers (except Josh Hamilton) because they were all wearing warm-up jackets over their jerseys. It was a nightmare. I looked up and saw a ball flying right at me. Home run? Line drive. Who’d hit it? Didn’t matter. I reached out and made a one-handed catch, and my streak was saved. Ten minutes later, I got a player (whom I later identified as Warner Madrigal) to toss me a ball, and I immediately handed it to the kid on my left. Guess what he did. He put away his glove and left the right field seats with his family and didn’t even try to snag another ball–and THAT is why I don’t like to give away balls during batting practice. I can’t really blame the kid. He got his ball, so why did he need to keep trying for another? But it’s the fact that he WAS trying that made me want to give him the ball in the first place. Normally I wouldn’t publicly humiliate someone whose crack was hanging out (okay, that’s not exactly true), but this guy deserved it. He was about 7-foot-4 and kept standing up and blocking everyone’s view. And when people yelled at him and told him to sit down, he yelled back and told them to stand up, even though he was the ONLY person standing.
? 219 balls in 29 games this season = 7.6 balls per game. Zack, I don’t think the Yankees ever had established rules it seems like every year they make up new rules on the spot, I would rather go to Shea sit in the upper dexk and get one ball than go to Yankee get 10 and sit in the front row at least the security at Shea has lightened up, plus Shea just is an overall better place to be and watch baseball at in my perspective at least. By the way: good job catching the Steinbrenners love and care for thier fans with the seats,even though they are building a new stadium that is ridiculous. Are you ******* kidding me? Now they’re not even allowing drawstring bags!?! Well it’s final: I’m not going back to Yankee Stadium for the rest of the season. Good riddance. I am a Yankee Fan as you know. I picked them when arriving to America last year based on the fact they were the only team who I had heard of back in England. If you have read my blog you will know that last month was my FIRST game outside of Yankee Stadium. Wow, only now do I see the exact thing you have blogged about. 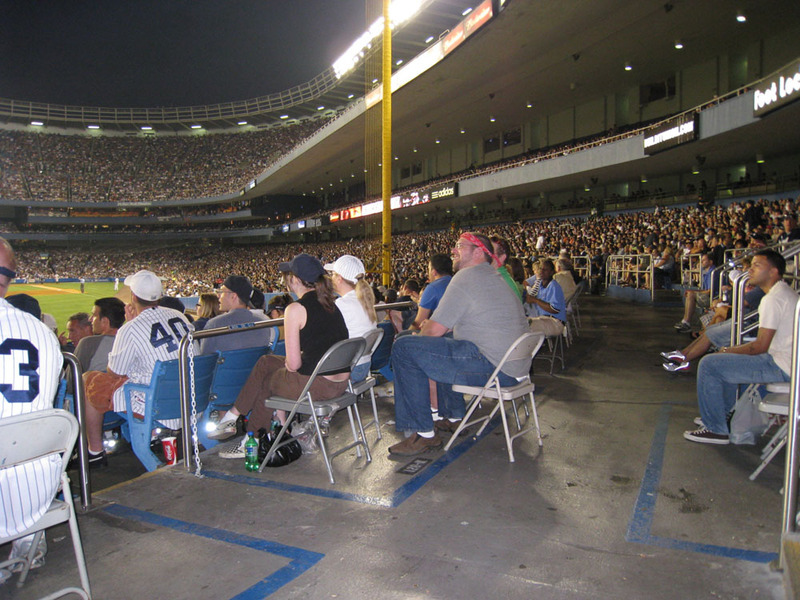 Yankee Stadium: Rude, full of idiots who don’t care about others around them, by smoking right in your face or pushing you out of the way, I could go on, but you know what I mean. I feel like I am a criminal, because I am TREATED like one while I am in the Stadium. I am going to stick to Minor League games from now on (as I love the game more than the Yankees), and I may go to the odd game at Shea Stadium. What a sad thing I represent though, I am a Yankee Fan who no longer feels welcomed for be bothered to attend games and pay good money to go watch them. Where players become legends and fans become targets for being cheated out of their hard earned cash, treated like criminals, and generally being looked after during their stay in Yankee Stadium like a neglected animal, and to think I actually paid for this treatment. One thing that does make me happy about YOUR experience, is the fact you only snagged two balls. Not that I don’t want you to snag lots but the fact I have failed myself in 16 attempts does make me feel better that it is not the best place to snag balls. Which gets me onto my question. 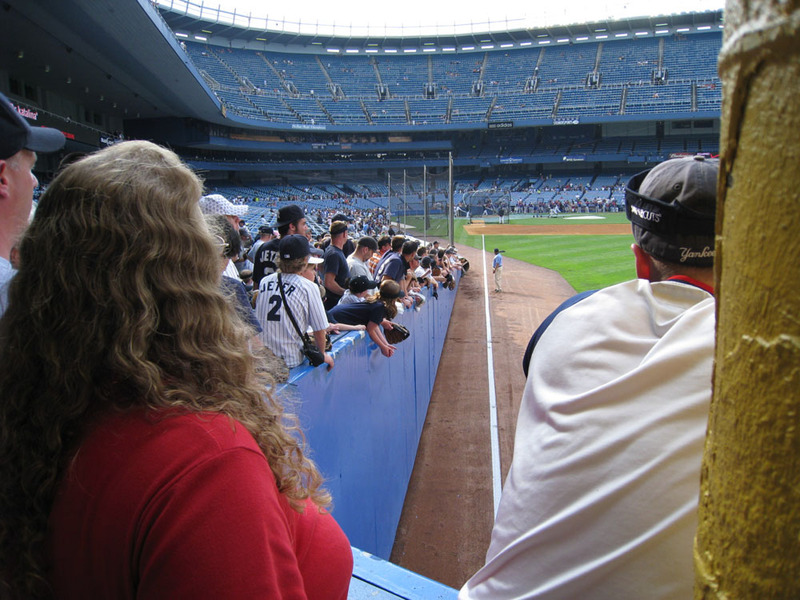 Which is the most friendly ballpark you have been to?, or to put it another way which is the most friendly ballpark, as you have been to them all. I don’t mean just the best to snag balls but the best overall for good mannered staff, players, etc, etc right down to the ushers. Yankee Stadium was not the place to break the 3500 mark. I don’t think I’d have the courage… or the stomach, given the, uh, “crack kills” display… to deal with Yankee Stadium. Vomit rises in my throat just thinking about it. I’ll take my attendance of 28,827 (no joke) here in Houston any day. Um, wow, those seats are… hideous. Good luck with future snagging. they let me in w. a drawstring bag! and, ive been told by a person who has seats behind the dugout, that they were chraging 9 g’s for 4 tix for all of the all star game stuff. my dad 2 in the tier reserved were like 1 grand. 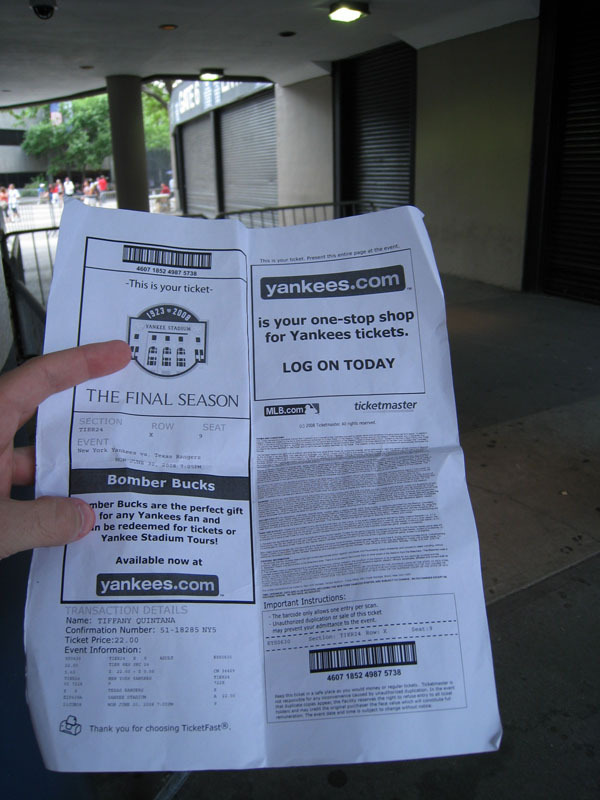 the guy also said that he thinks they are having a hard time selling tix at those ridiculous proces, cuz he keeps getting like the are-you-sure-you-don-want-to-go-broke-on-yankee-tickets emails, and on the diamond vision they kepy on advertising suites that werenet soled yet, which they never do. wait u can still use a cup trick? wow..unbelievable..wtf are they hurting? good thing my derby tix were free, no way id pay to go there. that gets me thinking, what am i gonna do for the hr derby? tape a string bag to my leg?? wow..this is unreal. i met zach i think a year ago. i thought he was just some crazy fan. every second he was running somewhere getting in my way. i actually didn’t like hem because he was always getting in my way. until one day a foul ball was gonna knock the mess out of me a glove came out of nowhere and cought it. yes, zack hample saved my life that day. we’ve been friends ever sense. i owe you zack, name it man. LETS GO METS. Zack.. Whew! I thought you were going to have a scam Utah story about the tickets. 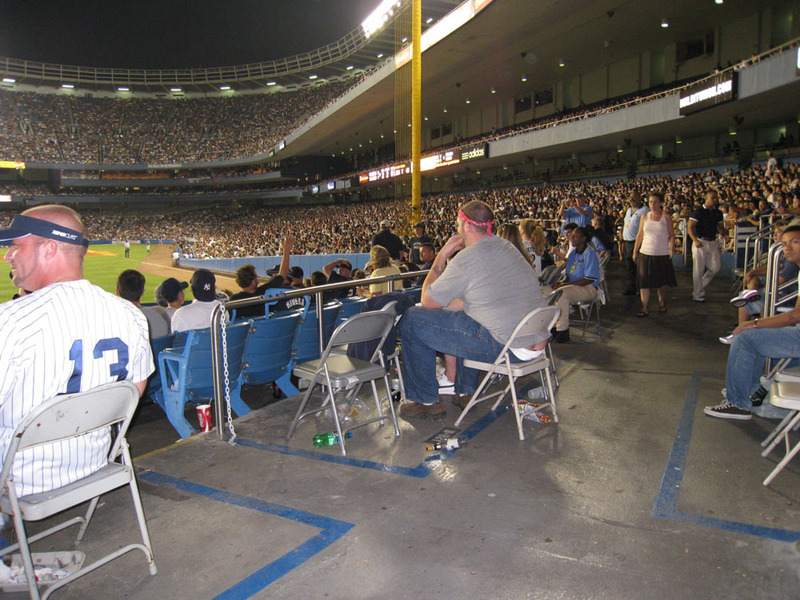 When you to go Shea or Yankee Stadium, do you just buy the cheapest seats you can get and roam around? Less male crack pics, more cuties with the giant glove, lol. Wow the Stadium must be the hardest park to snag at. I feel you with that “view”. I will be booking my trip to NY in 2 days. I will be staying at hotel near Shea from from August 1st to August 7th. I got some stupid questions. Is it dangerous to take subway from Yankee Stadium back to Shea on a Friday night after game? And how long does it take? I really worry about my safety. Forgive me asking stupid questions that eveything I know about NYC is from movie, TV and comic books(Spiderman, Ninga-Turtle). Hopefully I will get a chance to meet you inside NY ballparks. I wanna get your auto IP on your book. Tony Larussa should write a book called “The night I fell asleep at the wheel in Florida because I was drunk.” I’d read that one. That’s just TERRIBLE about Yankee Stadium. I’m guessing it will calm down in the 2nd half. You should move to someplace in Maryland. Then you could be right between two great snagging stadiums. Do you want to live in NY forever? When you retire, isn’t it a rule that you have to move to Boca Raton, FL anyway? Well, have fun at the old ballpark. Hope it gets better for you. it will be worse in the 2nd half cuz kids are off from school, so people bring their kids early and stay with them late. and i would become a mets fan, but the GM is a racist, and they fired their manager at 3 am after making him make the trip to the wets coast after he was assured his job was safe, and after his team WON the game! July 2, 2008 - 8:36 am . hahaha. I’m sorry that I had to read this entry Zack and I’m sorry that June 30, 2008 was possibly your last trip into Yankee Stadium EVER. Shea and Yankee Stadium are both dumps but if you look at it this way, Shea was first built in 1964 and Yankee Stadium had renovations going on in 1974/1975. 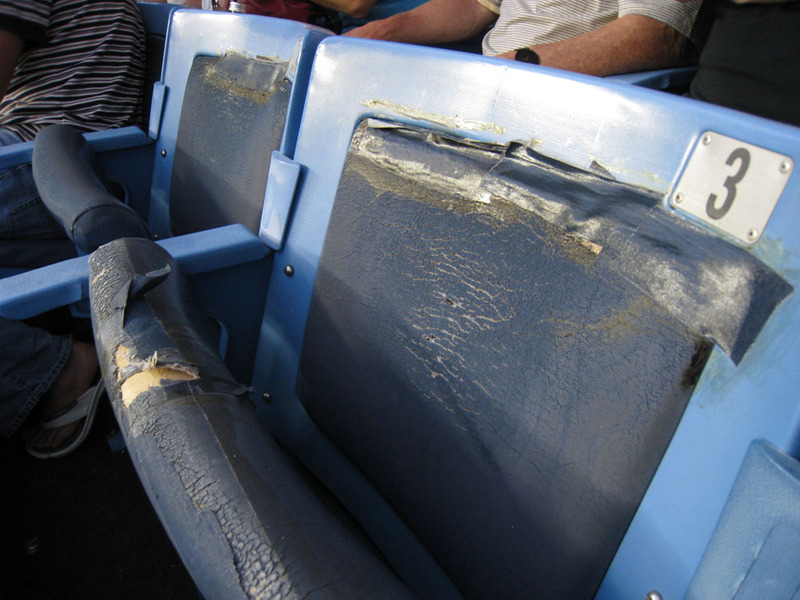 I have a yet to see a seat in Shea Stadium that is remotely close to as sh***y as the seat you had recently taken a picture of and shared with us. 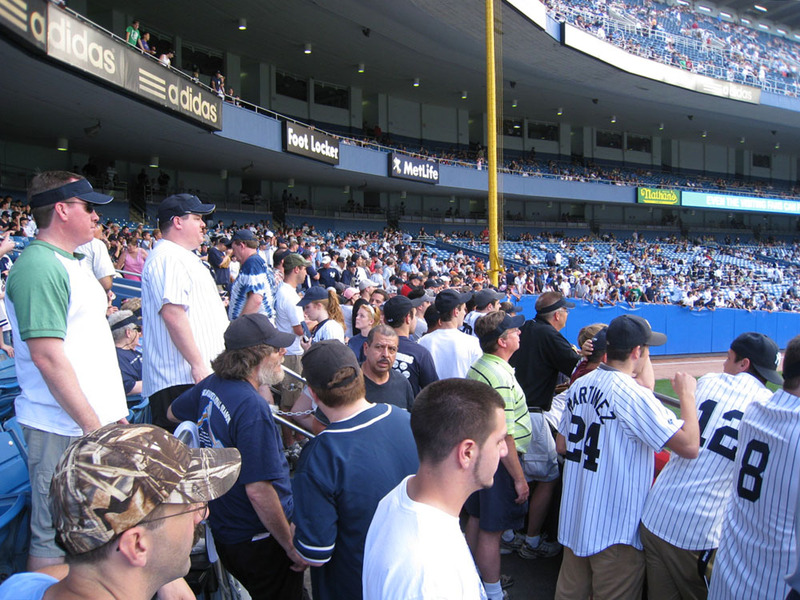 It could just be the fact that it is the New York Yankees and MOST Yankees fans (but not ALL) are disrespectful towards the stadium, other fans, players, and teams. Moving on, the last time we were at Shea (at the same time) was too long ago fine sir. I know for sure I have a pair of tickets for July 9 vs. San Francisco so if you are going to be home that day/week/time period, etc. let me know and we can meet up (? ), snag some baseballs together and hopefully enjoy a fine performance from the 2008 not-so-Amazin’s. Keep it real. I gotta stick up for Yankee Stadium. Someone has too! For ball snagging, it is the worst. Bar none. But if you are a Yankee fan as I am, I think it is a pretty good place to actually sit down and watch a game. I do hate the rude fans when ball snagging, but I think the fans are great during a game. Sure you get the occasional idiot, but you can find them anywhere (Like Boston, ha, ha!). Lastly, I actually asked a YS usher recently why they all seem so unfriendly and he said “Look, all game long we gotta deal with people trying to move up from there regular seat. Then they get mad at us when we tell them to go back to their own seat. It happens all game long. It is tiring and frustrating”. I felt a little guilty becasue I have also tried to move up from time to time. Brendan – I used that Stage Front Tickets group to get season tickets to tomorrow’s Orioles game. Thanks for referring me to them. They were fantastic. (They sold the tickets for below face value and FedEx’d them overnight). If anybody ever wants to go to LF for the first half hour of BP at Camden Yards, I highly recomment this group. Happy to hear that you got the tickets you wanted. Stage Front does a very good job. Thanks also for the info about the Mets picnic area. They are opening it up for the “Jets Night” soon but a person I know that got tickets said they told him the picnic area would not open early because they have to set up for the Jets signing autographs at 5:30pm. My ticket is for August so I hope nothing is going on. Am probably going to be a Shea anyway this Tuesday. Puck collector- Omar did not say the biggest rivalry was between blacks and hispanics, and what are talking hiring hispanics and overpaying them. Yeah, that was sad about Josh Hancock. He double dipped. He was HIGH and DRUNK when he died. People forget so soon. Then, you have the Scott Spezio incident and Tony Larussa’s. The Cards had a bad run there for a while. There such a good team now though. Great baseball city. The Padres had a guy die doing the DUI thing a couple of years ago. His name was Mike Darr. He left behind two kids and a wife. What an idiot. Threw it all away drinking and driving. Dude…you called out Omar Minaya for being racist. What a rant you’re on. So, do you want more black players on the Mets or more white players? The Hispanic guys he has seem to be doing pretty well. racist is the wrong word. i think he favors hispanics over whites. Ouch. Glad you agree with me about Yankee Stadium. Stadiums that are NOT on the coasts tend to be the friendliest places. I remember the people in Kansas City were *extraordinarily* kind. Gotta give props to Chase and Coors Field, although there ARE some annoying policies there, and I can’t blame the (otherwise awesome) ushers for enforcing them. I don’t think so. Maybe the rules will lighten up a bit after the All-Star mayhem. Good to hear from you! I’ve been able to sneak a water bottle inside on each of my last two visits, but yes, I think they DO normally confiscate all beverages. They might allow sealed bottles of water. Not sure. The subway is REALLY not that bad at all. The neighborhood around Shea (on the #7 line) is pretty harmless, in the grand scheme of things. Getting from Yankee to Shea on the subway would probably take about an hour. (Bring a book.) Those aren’t stupid questions at all. I hope we can meet up when you’re here. “Forever” is a long time, but right now I can’t imagine ever living anywhere else.